Wow, here’s is an old one. I finished it nearly a year ago. Even the photos are old. I snapped them before I stuffed it into a Christmas box along with the packing paper on a whim. Measurements are 6.25″ by 6.25″. An inch bigger would have been better. It’s worked with two strands of vintage Lily Sugar ‘n Cream yarn on 5 mesh locker-hook canvas. I think I used a slightly fatter cotton for the locking yarn. Maybe the same blue I used as for the center square and to bind the edges? Two strands of Sugar ‘n Cream gave good coverage, a single strand was not enough. I cut the strands off the ball strategically so I could keep the ombre color-changes matched up side-by-side. It was a bit of a pain catching both strands in the hook at once, but not too bad. They do want to twist around each other. Next time I would just let them. 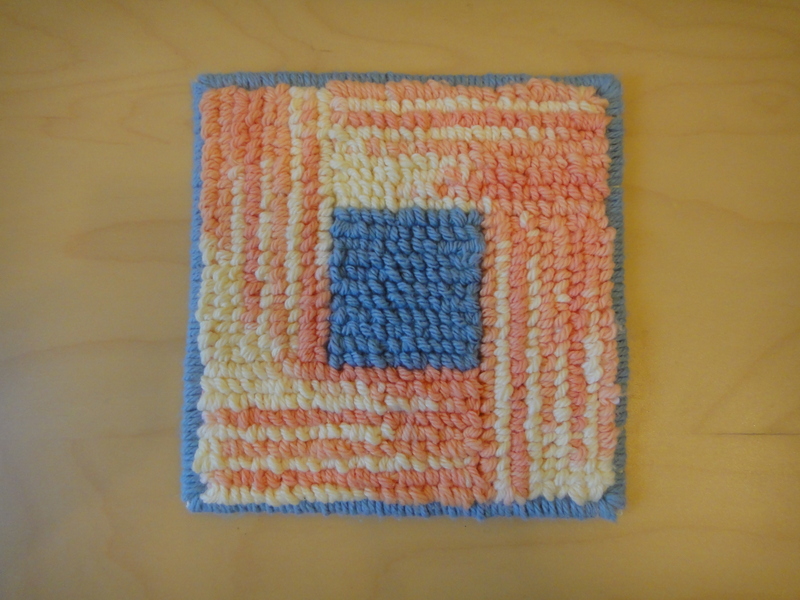 A person could make a very nice looped-pile bath rug or chair mats if their wrists were sturdy and they took it slow. Cheap yarn in lots of colors = plenty of patterning options. Something I noticed: this older Sugar ‘n Cream, from my Great Granny’s knitting stash circa 1980’s, is nicer than the Sugar ‘n Cream yarn you can buy now. It’s rounder, more evenly spun, less pill-y, and I’m pretty sure just a higher grade of cotton. If I were to do a bigger locker-hook project with this yarn, I would be careful not to mix old skeins with new. The resulting pile would sport noticeable variations in and texture and in height. The back of the work. I finished working the circle the day after I started it; what held me up was finishing finishing it. But now it is washed and blocked. Can you tell there are 5 different blues here? A couple are very close in this light. As I made it I began thinking of Medieval cosmology, celestial spheres. Last night Der Mann and I watched a program about quantum mechanics. Now it makes me think of quanta too. Here is the back before finishing. There were so many ends to weave in I couldn’t figure out where to put them all, so I cheated and made a few knots. Oh, yeah. 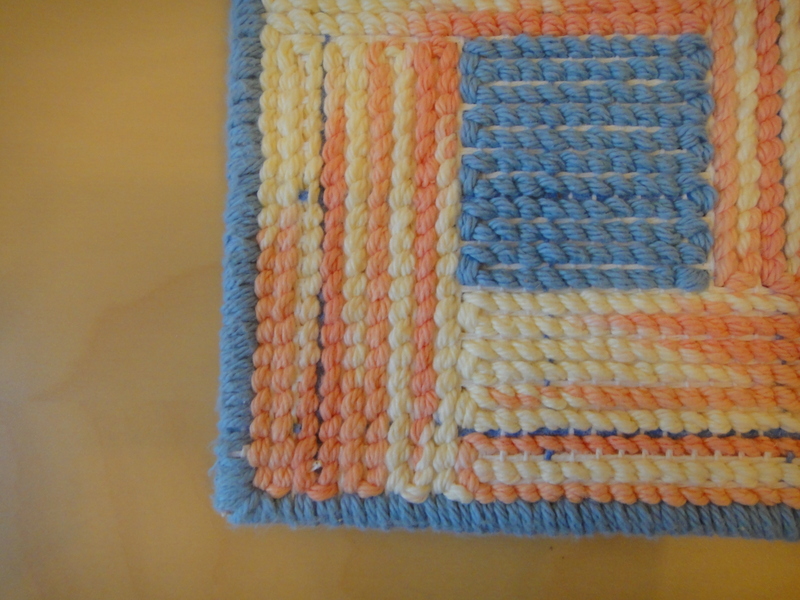 I forgot to say–it’s a trivet! Working the circle: inside out, and outside in. Through a curious sequence of events a nominal weaver may find herself in possession of a locker hook. 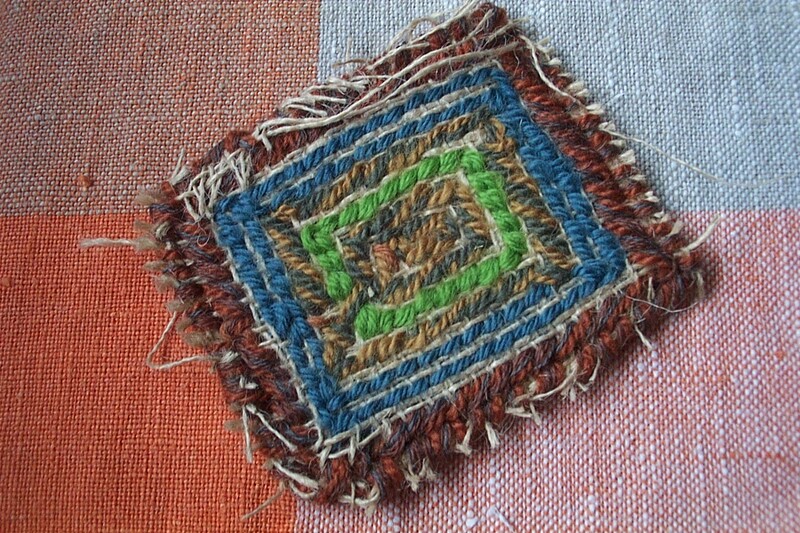 Locker hooking is a technique for making stable looped pile rugs. 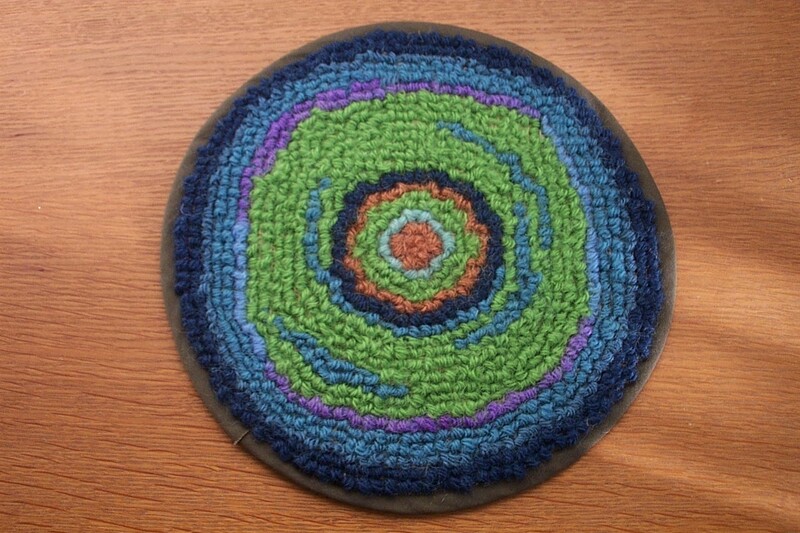 Unlike regular rug-hooking, which results in rugs held together merely by the friction of the wool poking through the ground cloth (rugs that can be unraveled by pulling really hard on a single loop; I scorn them! ), locker hooking locks loops in place by sewing through them after they are fetched up through the cloth. Why am I doing this? It’s complicated. How am I doing this? The hard way, as usual. 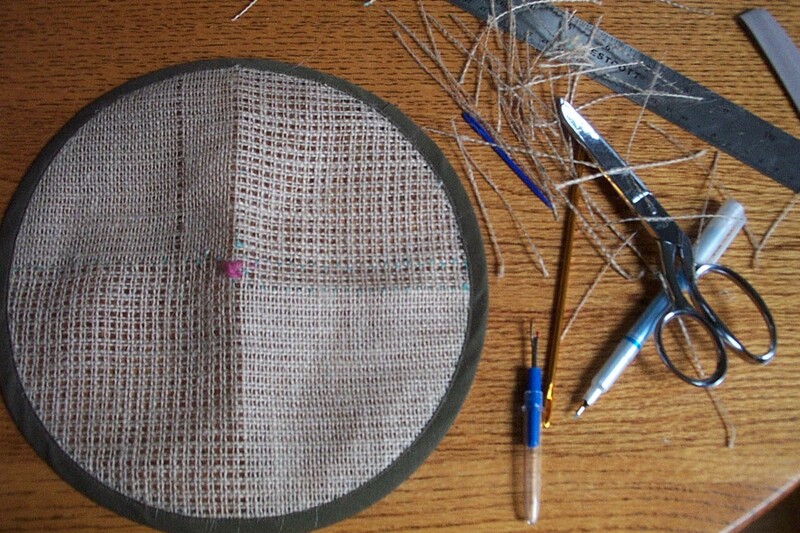 Instead of using pre-made mesh rug canvas, I have been making my own by drawing every third thread from pieces of burlap. 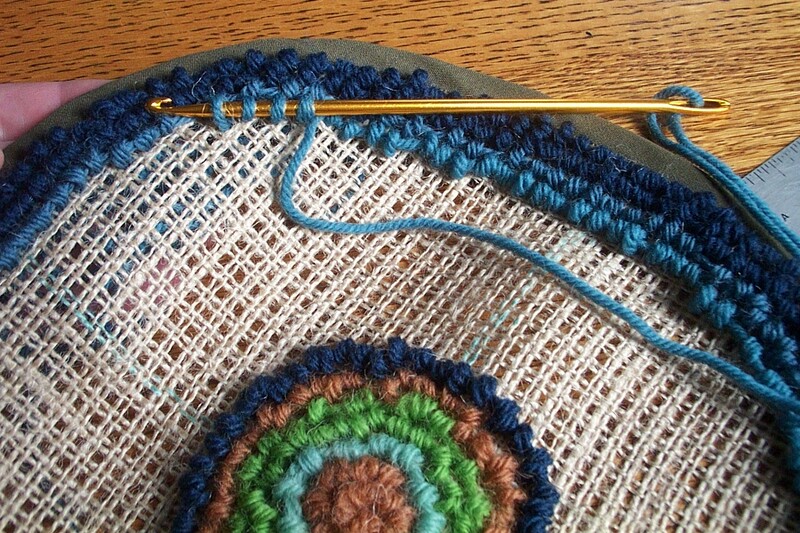 Instead of rags or bulky roving, I have been working with vintage tapestry yarn too skinny for the resulting mesh. Working in a spiral instead of back and forth, etc., etc. Here are my first washed samples. The rectangle taught me I have to bind the edges of the burlap before I do my drawn-work. Folding it over and whip stitching it isn’t enough, it unravels during washing. 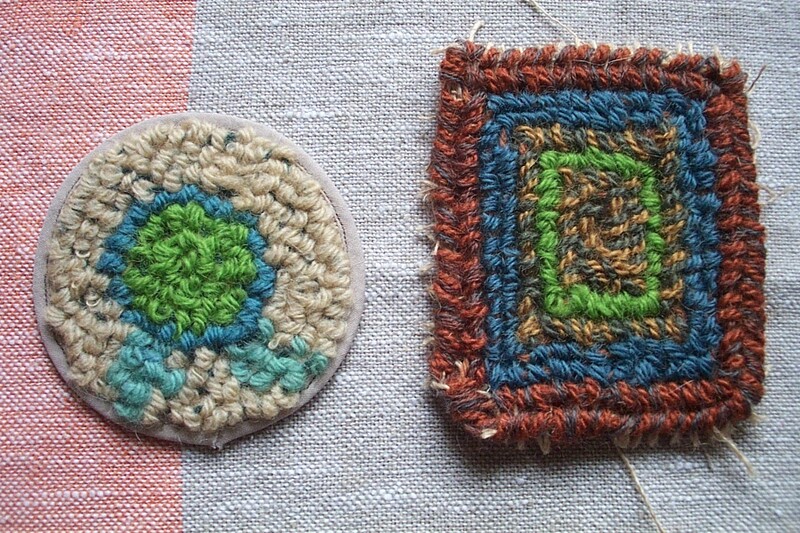 The coaster is what taught me you can’t find the center of a drawn-work burlap circle just by measuring it; the mesh isn’t arithmetical–this is why the central circle of the coaster is off center and I had to make it into a sort of a blobby flower by adding those blobby leaves to fill up the lopsided space. 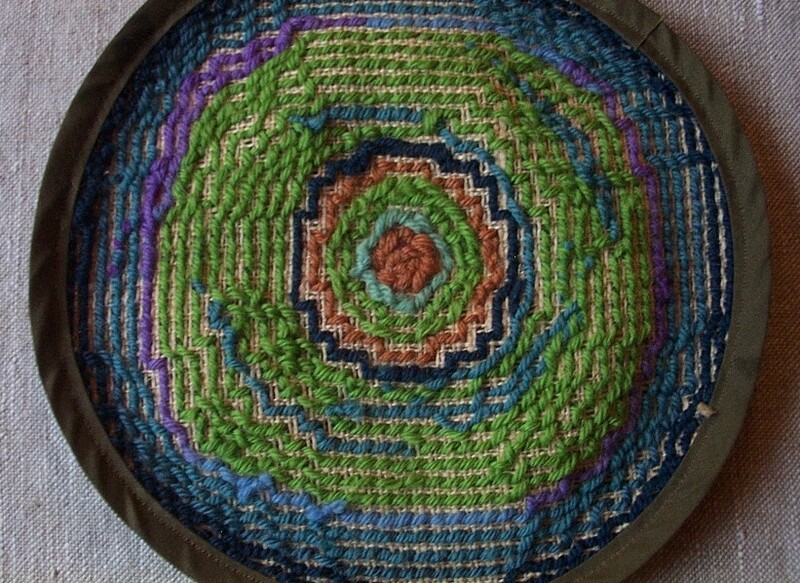 Oh, and the coaster taught me that the (dark green sock) stitching yarn has to match the (light tan tapestry) yarn because it won’t be fully hidden by the loops. Both samples reminded me that I am sort of allergic to jute. I now know keep a hanky handy when I am concentrating over allergenic work or my nose will actually drip on it. Nothing daunted, here’s what I started next. Atchoo!